Spring is among us already. The smell of fresh cut grass, the sound of birds chirping, and the warmth of the sun shining down. It’s time to get outside and enjoy the fresh air and what better way to do that than by relaxing on the new outdoor furniture you built. 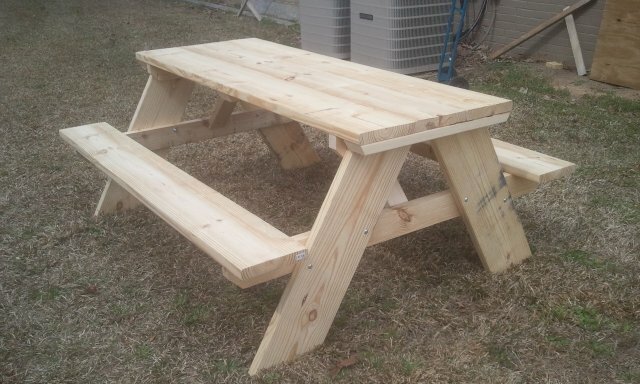 Here I will show you how to build a very strong and long lasting 6′ picnic table to go with your comfortable 2×4 benches and 2×4 arm chairs and side table. The design I use to make my tables incorporates fasteners that you typically do not see in other picnic tables; Pocket hole screws. The beauty of using these is that everything is secured from below. This means no ugly screw heads showing up on the table surface and sitting surface. It also means no splinters from screw heads and no places for water to pool and accelerate the aging of the wood. The design also calls for a horizontal support running the length of seat. This adds a significant amount of structural strength to the design. Not only does it support the seat better but also aids in preventing lateral movement. For those who are wanting to mass produce tables and sell them this may not be your design. It is geared more towards the person who wants to build a very sturdy high quality table for their use. This entire build is pretty simple and can be accomplished with minimal tools. You of course need a pocket hole cutter. For this I recommend the Kreg Jig. 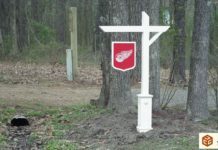 It is a pretty inexpensive tool that you will find many uses for down the road. You also need some type of saw. Every cut on this project can be completed with a circular saw. I used a miter saw and table saw as I already have the tools but remember these aren’t necessary. An edge guide can be attached to your circular saw for rip cuts (2 rip cuts in this build) and you can use a speed square to make perfect 45° and 90° cuts instead of a miter saw. You also need a drill. With everything back at the shop we can start preparing the wood. I recommend following the cutting diagram to complete all the cuts before any assembly is started. It is sooooooo much easier to build when everything is already cut and waiting on you. 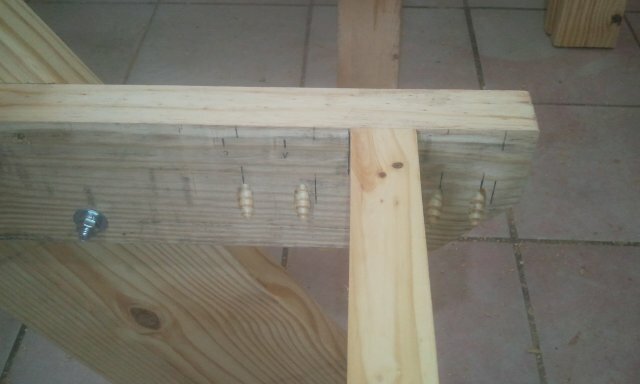 Glue goes down before these braces and I put 5 screws through the brace and into each table slat. With all three of the braces secured to the table we can work on the leg assemblies. The legs can be a pain in the behind to assemble sometimes. 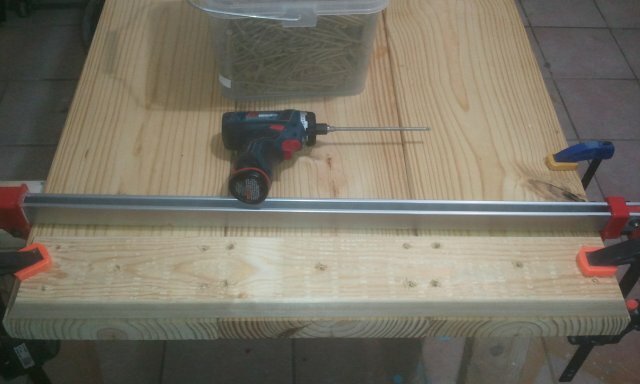 To aid in assembly I like to use a mobile cart in my shop that is pushed up against a wall. You don’t have to do this but it makes assembly a lot less troublesome. On my wall I have two marks spaced out at 56-3/8″ with another mark in the exact center. 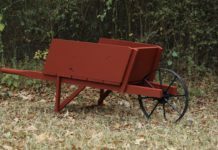 This allows me to place the legs flat on the cart and use the wall as if it were the ground and position them so that their outside edges are the appropriate distance from each other. I build quite a few picnic tables so these reference marks are a huge time saver. You don’t have to mark up your walls though. If you choose to do this simply use some masking tape on the wall and mark on the masking tape. When you are done remove the masking tape with no damage to your wall. With the legs in place I can secure the lower leg rail. I also put a mark on the center of both the lower and upper leg rails. This allows me to use a carpenters square referenced off the center mark on the wall to align the pieces left to right when securing them. The lower leg rail is positioned so that its top surface is 17″ away from the wall. I use a few 2″ brad nails here to hold it steady while I screw it in place with 2 screws along the short diagonals of the intersecting parallelogram (If I just lost you there I explain this better in the video). The upper leg rail is installed next referencing the top surface with the top of the legs and using the center point to line up with the center point in the lower leg rail. This time four screws are used to secure it into the legs. After that we drill the holes along the long diagonal of the intersecting parallelogram to further secure the lower leg rail to each leg (again, explained better in the video). With both leg assemblies done we can attach them to the table top. Place the legs on top of the table top so that the pocket holes are on the inside. I clamp the legs to the outside top brace here but it’s not 100% necessary. Then secure the legs to the top with the nine pocket hole screws. If you followed the cutting diagram the screw holes should have been cut to put three screws in each 2×10 top piece. The seat supports will go in next. When cutting the lower leg rail I recommend laying out the position of the seat support as it helps this step tremendously. 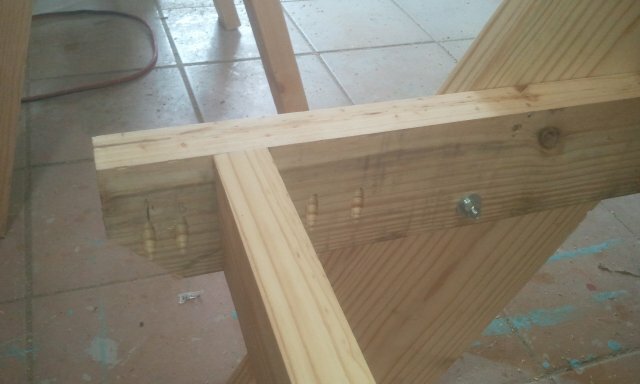 The seat slat is secured in to the lower leg rail with two pocket hole screws. It may be beneficial to have a helping hand hold the other end while you secure it in place. A couple clamps will do the trick as well. That’s what I used. 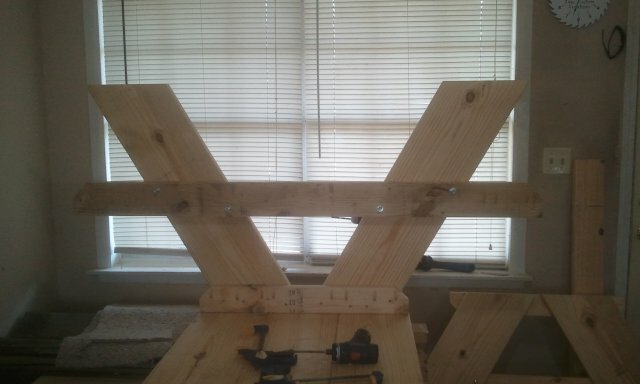 Before we get too far we need to add the connecting brace between the table top and leg assembly. These two pieces are cut from a piece of 2×4 material with 45° miters cut vertically on each end. Simply secure them to the top with two screws and to the lower leg rail with two screws. Be careful not to penetrate the top of the table and outside of the leg rail. With the table turned right side up we can add the final two pieces; The seat boards. These are centered on the seat support rail. I recommend securing the ends via the screw holes in the lower leg rail first. Working from one side to the other can allow the piece to shift slightly as you work your way across. If you are working with non treated lumber than you have to seal it somehow. I chose Thompson’s Water Sealer. It is a great product and hasn’t let me down. Sealing your table is something that should be done every year or two to make it last a lot longer. Now the most important part. You MUST do this in order to complete the project. You have to stand back, take it all in, and pat yourself on the back. 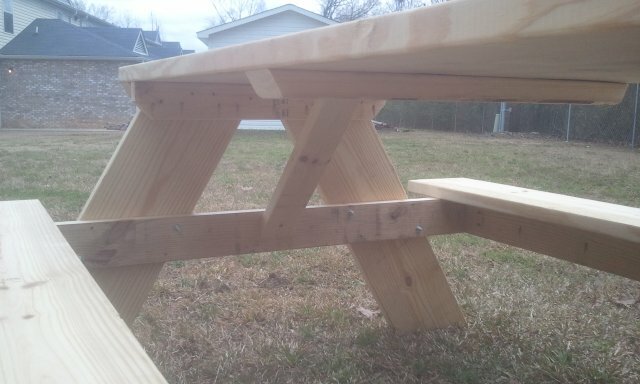 You just built a very strong picnic table for probably half of the price of a lower quality table. Congratulations! Here is link to a zip file containing five printable diagrams as well as the SketchUp file. I also made a video showing the assembly processes from start to finish. I hope it helps! Thanks for watching! How many people will this seat? 6 adults or 8 kids is the max typically. Hello Deborah. I am in central Mississippi and yes I do sell them locally. Printing this off for hubby….what adjustments would he make for an 8′ table. What adjustments would he make for 8′ table only (no attached benches)? 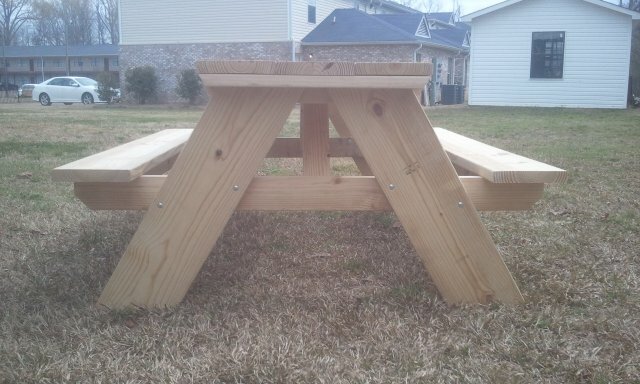 For a 8′ table just add 24″ to all of the bench and top pieces as well as the seat stretchers. Thanks for the kind words. I wish you the best of luck! Let me know how it turned out! Great job on the table. I like the attention to detail and especially the strength of the design. What kind of wood was used? Regular construction grade pine from a lumber yard. You can use treated lumber if you want. Would you recommend using treated lumber for the top? Some discourage using it for “safety”. All personal preference really. I’d prefer not to. It will last longer if you do though. What angle are the legs cut? How many degrees? what would the max weight this design could hold. like a 300 or 400 pound person could cause a problem after a few years of element wear and tear. 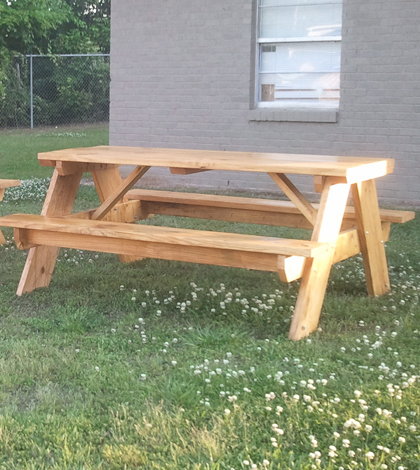 I made one picnic table off of this design last fall, using untreated lumber. It has been sitting outside during a Tennessee winter and still looks great. The only set back from using untreated lumber is that the wood acts like a wick and will draw moisture up from the ground. If your going to use untreated lumber, when your done building: fill four pans with stain/sealer and allow the table to legs sit in it to soak it up for a while. I told the guy at the hardware store what I was planning on building and he suggested that I did that. I didn’t do it, but wish I did. It is still a sturdy table without having done it, however it noticeably took some life away from the table. This had been one of the first wood working projects I have done. Even after telling people that this was my first, I have over 20 requests from friends and neighbors to build them one. You get what you pay for, and this one is worth it. 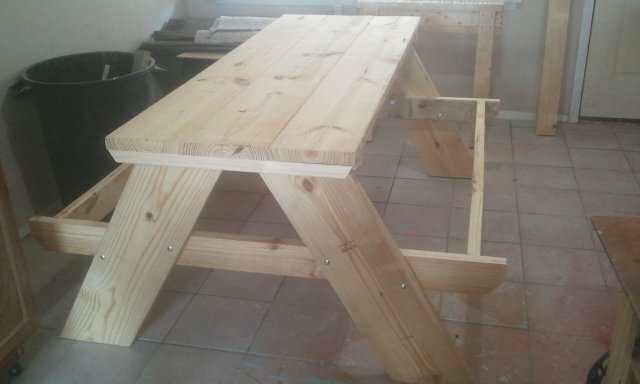 My picnic table is currently now my work bench used to build other tables. Don’t build one, build three and sell two of them and break even with a free table. – That’s if you sell them for cheap. For the beauty and integrity of the finished table, with the current prices of tables, this one could sell for $250 – $300. 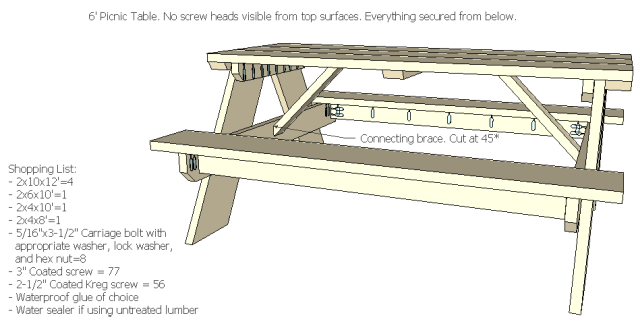 Would the Kreg R3 Jr. Pocket Hole Jig System pocket hole cutter work fine for building this table? According to the specs on Kreg’s website it says it will work with 1-1/2″ wood so I would say yeah. What pocket hole cutter do you use/recommend? When do you use the Kreg screws and when do you use the regular 3″ coated screws? Use the Kreg screws everywhere you see an arrow on the diagrams. 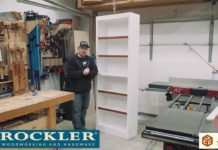 What pocket hole cutter did you use for this project? I set my jig for 1 1/2 boards and the 2 1/2 kreg screws would penetrate the surface. Must have to use that collar to control depth?? It was my first time using the jig so I guess I screwed up. Ended up having to use some 2″ stainless wood screws I had onbhand and reinforcing everything w glue and a few other strategically placed 3″ all weather screws. 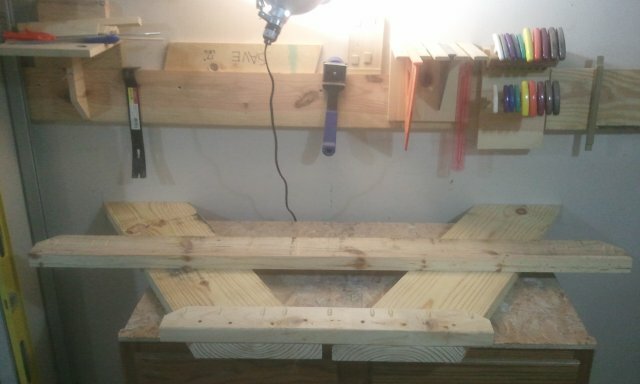 Also I didn’t see the measurement so I guessed that the seats overhang the supports 1 1/2″. Also good to mention that the grain of the wood for the seats should cup down to prevent water puddling. Great stuff buddy and thank you! Is there plans for a 10′ table that is shown in your video? Hey Jay, I am doing a project for my school where will be fixing up a vacant area across the street from my high school. Me and my fellow student government class will be adding things like bird baths, sun dials, planting trees, rain collectors, gardens and etc. My selected area was picnic tables and you seemed like a great person to come to. I was wondering about how much did the materials cost you to build this awesome table. You have lots of great info and pictures. I would be very thankful to have your help and opinions on this. Hey Raven. I think what you guys are doing is awesome. I wish you the best with it. The tables run $75-125 for materials depending on if you use treated lumber or regular and where you get the hardware from. That was my general cost anyway. Good luck and shoot some pictures when you get the area completed! 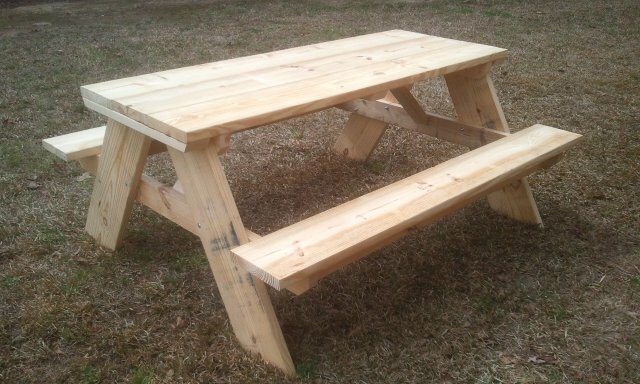 I would assume that you could easily turn this into a 12 ft picnic table by using 12 ft pieces for the top and benches while adding a third support like the two ends? Hi Jay, I was wondering if the Kreg jig system would work the same for composite material? I’m retired now and am looking into making stuff like this to sell and I think people would go for the composite aspect for the longevity in weather. Jay, have you built one using 2×12’s for top (and maybe benches also)? I’m looking at it being an 8′ table. Nope…just 2×10’s. You can use 2×12’s though. Hi Jay. In my area (Salt Lake City) I’ve had a hard time sourcing pine in those board dimmensions. I am turning up only Fir and Redwood as options. Would either be a good option in your opinion? Any wood will work. Redwood will be best but probably more expensive. Not really a reply, but I wanted to ask a question and I thought you would get notified of the post this way. Did you runt he wood through your table saw to square it up? Nope. I left the rounded edges. Jay, haha I sent an email before I saw this reply. Sorry.